This data set provides vegetation species and vegetation plot data collected in 1983 from 293 study plots on 41 pingos on the North Slope of Alaska. The pingos were located within the Arctic Coastal Plain in the Kuparuk, Prudhoe Bay, Kadleroshilik, and Toolik River areas. Specific attributes include dominant vegetation species, cover, soil pH, moisture, and physical characteristics of the plots. 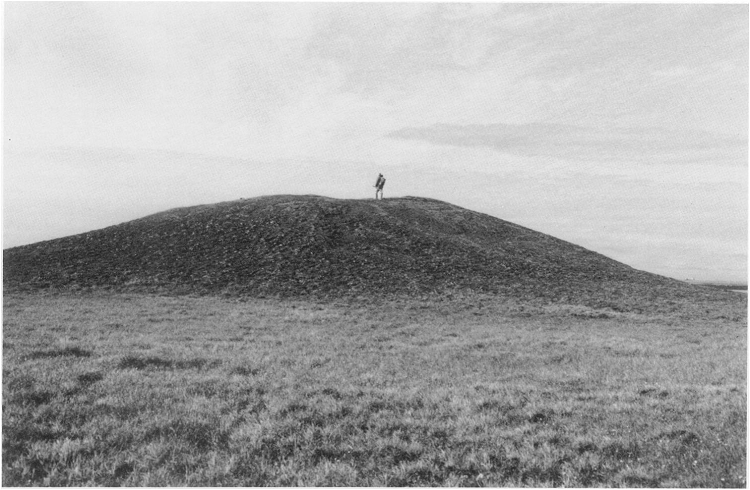 The pingos are ice-cored, dome-shaped mounds found in permafrost regions and are an important component of the Alaskan central Arctic Coastal Plain landscape. A complete list of plant species was obtained for each plot. The vegetation pattern is complex due to differences in slope angle, slope aspect, effects of wind, disturbance by animals, site stability, and deposition of snow, as well as meso- and macroscale patterns related to the coastal climatic gradient and substrate variation. There are two data files with this data set in comma-separated (.csv) format. Figure 1. A typical pingo, Prudhoe Bay, Alaska. This feature is 7 m high and has a basal diameter of 110 m (Walker, 1990). Vegetation species and vegetation plot data were collected in 1983 from 293 study plots on 41 pingos within the Arctic Coastal Plain of the North Slope of Alaska. The pingos were located in the Kuparuk, Prudhoe Bay, Kadleroshilik and the Toolik River areas. Specific attributes include dominant vegetation, species, and cover, soil pH, moisture, and physical characteristics of the plots. Pingos are ice-cored, dome-shaped mounds found in permafrost regions and are an important component of the Alaskan central Arctic Coastal Plain landscape. The pingo vegetation is a complex vegetation pattern which is the result of differences in in slope angle, slope aspect, effects of wind, disturbance by animals, site stability, and deposition of snow. In addition to these microscale controls, meso- and macroscale patterns related to the coastal climatic gradient and substrate variation are also reflected on pingos. Sampling was opportunistic. Circular plots were 12.5 m2 and were permanently marked. Each pingo was assigned a name and number unless already named on US Geological Survey Maps. scalar_value_tables_pingos_env_data.pdf Document which provides the tables of scalar values and codes used to estimate and describe environmental variables. This pdf is provided for user’s convenience. These tables were taken from the companion file above. Much of the data were described and estimated using scalar values and codes. Refer to the companion file scalar_value_tables_pingos_env_data.pdf for these values and codes. Data not provided are represented as -9999. 7 latitude decimal degrees Plot latitude provided in decimal degrees. 8 longitude decimal degrees Plot longitude provided in decimal degrees. 10 general_landscape_unit code Code (number) used to describe the general landscape. 14 exposure_wind scalar Exposure of individual plots to winds estimated using a scalar value. This file provides species cover classes by percent. Values greater than 0.5 but less than 1 percent were assigned the value 0.7. Values less than 0.5 but greater than 0 percent were assigned the value 0.3 percent. 2) Cladonia fimbriata (Cladonia fimbriata and Cladonia chlorophea). These data could be useful to climate change studies. Data were entered into the CYBER computer at the University of Colorado for analysis. At each stage, a series of checks was used to ensure accuracy against the field notes. Refer to the comp file pingos_veg_plots_report.pdf for additional information. 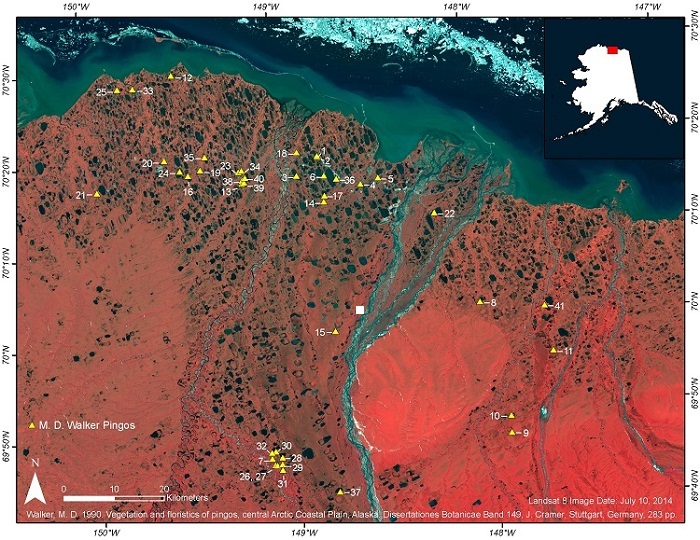 The study area was within the Arctic Coastal Plain of the North Slope of Alaska, in the Kuparuk, Prudhoe Bay, Kadleroshilik, and Toolik River areas. Pingos are ice-cored, dome-shaped mounds found in permafrost regions and are an important component of the Alaskan central Arctic Coastal Plain landscape. They may be as high as 50-m, with basal diameters exceeding 1-km, but on the coastal plain most are between 5 and 20-m high, with diameters between 70 and 400-m. Pingos are not evenly distributed across the coastal plain but are abundant in areas with sand and gravel substrates. The pingo vegetation is primarily dominated by Dryas integrifolia although it is not present in all stand types. The complexity of the vegetation pattern is a result of differences in in slope angle, slope aspect, effects of wind, disturbance by animals, site stability, and deposition of snow. In addition to these microscale controls, meso- and macroscale patterns related to the coastal climatic gradient and substrate variation are also reflected on pingos. Soils on the pingos are Mollisol, Inceptisol, Entisol, and Histosols. Distribution of the soil types was related to microsite and regional gradients (Walker, 1990). The pingos in the study are described as (1) steep-sided, with relatively steep side slopes, usually between 10 and 30-m, found exclusively within the boundaries of recognizable drained thaw- lake basins, and presumed to be a result of the formation of permafrost in thawed, saturated, coarse sediments following lake drainage; or (2) broad-based, having a greater total volume and gentler side slopes than the steep-sided pingos (Walker et al., 1991). Nine pingos in the study area were considered to be the broad-based type. A total of 293 plots were located on 41 pingos in the four areas listed above. Final latitude and longitude for the pingos were estimated in 2014 using topographic maps and a project mylar overlay, color infrared aerial photographs, and Google Earth. Figure 2. Locations of the 41 pingos in the study areas of the Arctic Coastal Plain (Walker, 1990). Sampling was opportunistic. Circular plots were 12.5-m2 and were permanently marked. Each pingo was assigned a name and number unless already named on USGS Maps. i) frost boil (1 plot). One plot had insufficient location information. Figure 3. Topographic map of Pingo 6 (Angel) with a 1.5-m contour interval. Seven microsite sampling locations are labeled as (1) ENE wind exposed, (2) summit, (3) dry leeward side snowbank, (4) middle of snowbank on leeward side (well-drained), (5) bottom of snowbank at leeward base of pingo (poorly drained), (6) south slope, (7) north slope. 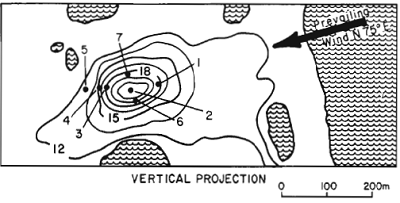 Topographic information from Air Photo Tech 1979 (Walker, 1990). g) steppe tundra communities on south facing slopes of pingos (19 plots). A complete list of plant species was obtained for each plot. Most of the environmental plot data were estimated using scalar values and prior information from related publications. Soil pH was determined in the laboratory. Refer to the companion file pingos_veg_plots_report.pdf for additional information. This data set was provided by the GINA repository at http://geobotanical.portal.gina.alaska.edu/plot-archive/plot-datasets/33-toolik-lake. Walker, M.D., D.A. Walker, K.R. Everett, and S.K. Short. 1991. Steppe Vegetation on South-Facing Slopes of Pingos, Central Arctic Coastal Plain, Alaska, U.S.A. Arctic and Alpine Research 23: 170-188. Walker, M.D. 1990. Vegetation and floristics of pingos, Central Arctic Coastal Plain, Alaska. Dissertationes Botanicae. J. Cramer, Stuttgart, Germany.